The occasion of the NYT Magazine article was to discuss how Bill Gates had watched the course, met the instructor, David Christian, and proceeded to work with him to develop a high school curriculum based on the college-level course Christian had been teaching. I was intrigued enough to buy the audio version of the Great Courses program, which, probably not coincidentally, happened to be on sale at the time. The premise of the course is that most history courses cover only the period from the beginning of writing, or slightly before, to the present day, and that omits the greater part of the history of the universe. 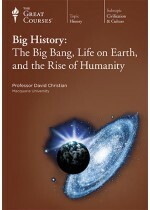 Big History teams with science to provide a much more expansive story of the universe. This means that our species Homo sapiens does not show up until lecture 21 of the 48 lecture course. But that is appropriate in the context of the material being covered. The course has not been revised since it was initially published in 2008. For the most part it holds up well, but some of the material is dated. For example, Christian categorically states that humans never interbred with Neanderthals, something we now know from genetic evidence absolutely did happen (and that humans are probably stronger and healthier for it). Six years is an eternity in modern science.